Wildfires not only cause direct damage to homes and buildings in their path, but also many other structures not touched by the flames may end up with extensive smoke damage. 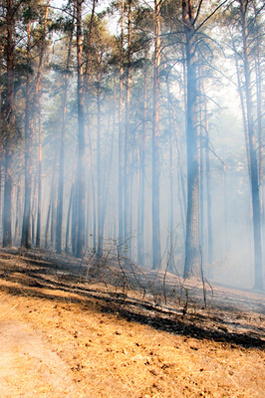 The large amount of smoke released by a wildfire is filled with combustion by-products that include soot, ash and char. This smoke can travel long distances and can have damaging effects to the properties they impact and their building occupants. Often times, property owners and residents of smoke damaged properties have to show proof of damage before insurance providers will approve any repairs and remediation work. Testing for smoke damage takes true expertise and access to advanced instrumentation. Don't be fooled by laboratories that provide inexpensive testing by light microscopes alone. Due to the size of many combustion byproducts, especially black carbon, analysis with light microscopes alone is inconclusive and generally not legally defensible. LA Testing performs smoke damage testing using a combination of scientific techniques, including the use of our Electron Microscopy (EM) Laboratory. LA Testing's advanced analysis frequently results in the dismissal of other less reliable techniques in legal cases. The scientists at LA Testing are experts at delivering smoke damage and soot testing services to assist property owners, environmental experts and insurance providers following a fire.